“Never discuss Politics, Religion or Money in polite company” my father told me. He’s right, these have to be the top 3 topics for starting arguments and if you’re at a wedding reception that’s not appropriate. If you’re in a bar with your mates however it’s a different story. Think of my Blog Roll as the “polite company” of this site. It’s where I write formal articles and sometimes funny but non-controversial stuff. This however is a traditional British boozer. A few years ago I took the very deliberate decision to stop wearing a remembrance poppy, because I actually believe in remembrance. Take a look around social media in the few days around November 11th and you’ll see an awful lot of messages simply thanking military personnel for their service. That is only half the message of remembrance. Not only that but without the other half it’s a dangerous message because it’s easily corrupted. We sleep-walked into the First World War. The warning signs were there years before. They were noticed, alarm bells were rung, governments were advised: “unless we change course,” they were told, “there will be war”. The warnings were ignored and there was the most terrible war the world had ever seen. The economic and social devastation of the First World War pretty much guaranteed the subsequent rise of populism, particularly in the hardest hit countries. That does not however mean that the rise of the Nazi Party was inevitable. They could and should have been stopped. Martin Niemöller’s seminal “First They Came” highlights just one thing – that it was within the power of ordinary people to stop it. However we stood aside and did nothing and by doing so damned a whole generation. Tens of millions died in two catastrophic wars, both of which were entirely avoidable. For me that has always been the meaning of the phrase “Lest we forget…” We must remember the senseless waste of two generations. We must never again sleep-walk, or let ourselves be led as lambs into another unnecessary war. Make no mistake, I am not a pacifist. There are times where war is the only practical solution. And of course I support The Royal British Legion and Help For Heroes, of course I have enormous respect for those who are prepared to lay down their lives to defend the free way of life. There is a very important distinction however between the individuals who serve and those who would lead us into war. The latter, we must reflect, is substantially our fault: in a democracy we are the ones that set the agenda. In remembrance it is therefore not sufficient simply to thank those who have given military service. We must take time to reflect on why their service – and in many cases sacrifice – was needed. We must reflect on our failure as the people of the United Kingdom, the people of Europe, to prevent two devastating wars and numerous conflicts since. Moreover those who do not learn from history are doomed to repeat it. We can see, very clearly, where the mistakes that led to each war, each conflict were made. It is imperative that we learn those lessons. Currently some of The Poppy’s most ardent supporters are far right groups. Far from being reflective and contemplative on the horrors of war, these groups delight in militaristic imagery and seek to glorify military conflict. Economic stagnation breeds populism. Austerity breeds populism. Populism inevitably veers either toward communism or fascism. These are delicate times and we, those of us who are sufficiently well informed to understand this, have a duty to try to steer our countries away from those extremes. This is why I don’t wear a poppy: because I believe that it is not an effective means of communicating how I feel about remembrance. Because most people just pin the badge on because they think they ought to without really understanding it. Because that lack of understanding is easily corrupted into support for very people that Remembrance was designed to condemn. Because I’m scared that as the generation that fought the Second World war dies out, the memory how of terrible, how devastating it was and why we must never allow history to repeat itself will die too. Because I’m scared that we will wear The Poppy and tell ourselves that we have not forgotten when in truth we have. This entry was posted in Life, Politics on 2018-11-06 by Tom Fosdick. It hit me about 4pm today that although I’ve done a lot of myth debunking on social media and directed people to well supported articles, I haven’t actually expressed my opinion on the EU Referendum. In the UK we’ve had something like 8 years of economic stagnation. Whenever something like that happens there are certain things that history tells us will follow. People will lose faith in the politicians of the day and start looking for answers elsewhere. New movements will spring up saying that they have the answers. The things they say are always the same, we need to break free of regulation, bureaucracy and red tape, we need to empower the individual, the problems are caused by some external entity (usually immigrants) and most of all we need to take our country back and make it great again. Right now that’s Farage, Trump, Le Penne, Marusik, etc. These things are not the answers because the sad, soul crushing reality is that there are no answers right now. Our problems are caused by a combination of the poor performance of the global economy and our own mistakes and inadequacies. We have consistently failed to invest in public services and infrastructure. We have failed to properly regulate the financial sector. Time and time again we have put short term gains before the necessary long term strategy. These things and others are the cause of our current malaise, not our EU membership. I can’t believe it, but I basically agree with what Boris said in 2013 (I disagree on many of the details, BTW). 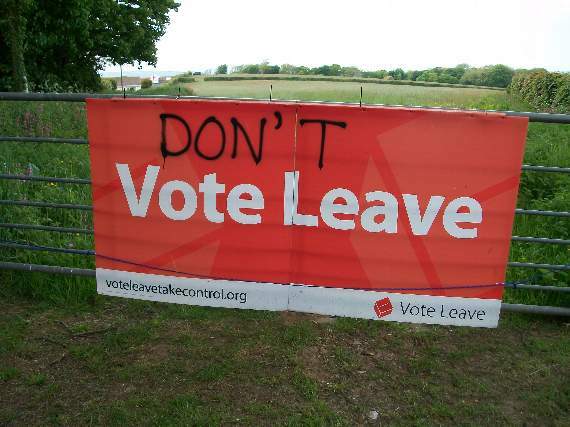 Leaving the EU will not bring us any significant gain, even in the areas that the Leave campaign are targeting. If we stay in the Free Trade Area (like Norway and Switzerland) we will have to accept almost all of the EU’s rules, including the free movement of people. At the moment we’re one of the big 3, with France and Germany we’re the most influential countries in Europe. We’d lose that so we’d effectively lose sovereignty – because at the moment we have some control. It would also make democracy worse as at the moment we all have a voice through the UK government and through our MEPs. We’d lose that. I’m sure I needn’t point out that the proposed points system on immigration is highly unlikely to be acceptable to the EU if we remain in the Free Trade Area. So we’re talking about a substantial divorce from Brussels, that’s the only way we can get any freedom of movement on immigration. Sovereignty and democracy are more complex arguments but neither would be a cavalcade of success. They’re both pretty minor gains if you analyse them in depth (NATO, WTO, IMF, UN, House of Lords, FPTP etc). The problem with this is that even the Leave campaign recognise that this would hit our economy hard. Unemployment would rise, the welfare bill would rise and the economy would slow down long term. The slower the economy the less money there is flowing around the less the government gets in tax, the less we can afford to pay out in welfare and services. Even a tiny slowing would eclipse the EU membership fee from the government’s budget so what we’re facing here is not investment in services like the NHS, but even more and ever more severe cuts at a time when we really, really don’t need that because half our problems are caused by our failure to invest in the past. The numbers can only work if we remain in the Free Trade Area which gains us nothing but a tiny bit of pride. It’s pointless. There’s no quick fix for the situation we’re in, it’s going to be a long hard slog but there will be an upturn. When there is there’ll be more money flowing in the economy so the government will get more in tax and we can afford to put right some of the mistakes of the past. If we stay we can hold our heads high, we’ll be at the top table of the EU, the largest market in the world, a major player on the world stage. If we leave we seriously risk becoming an ever more irrelevant and isolated sad little island. I am proud to be from Suffolk, proud to be English, proud to be British. I care about this country and I care about its place in the world, so I will be voting to remain a member of the European Union. This entry was posted in Life, Politics on 2016-06-22 by Tom Fosdick.